How did you become interested in calligraphy? In 1999 I travelled to Morocco to explore the different traditional arts and learn Arabic. I spent a year living in the Fez Medina and working with different traditional masters on traditional tilework (zellij), stucco carving (jibs), geometric patterns and so on. I also met a self-taught calligrapher who initiated me into the art of calligraphy. Even though it was quite rudimentary, it made me want to explore further and look for a teacher who had his ijazah (the calligraphic diploma which links the master to the calligraphic chain of transmission, which goes back for centuries). 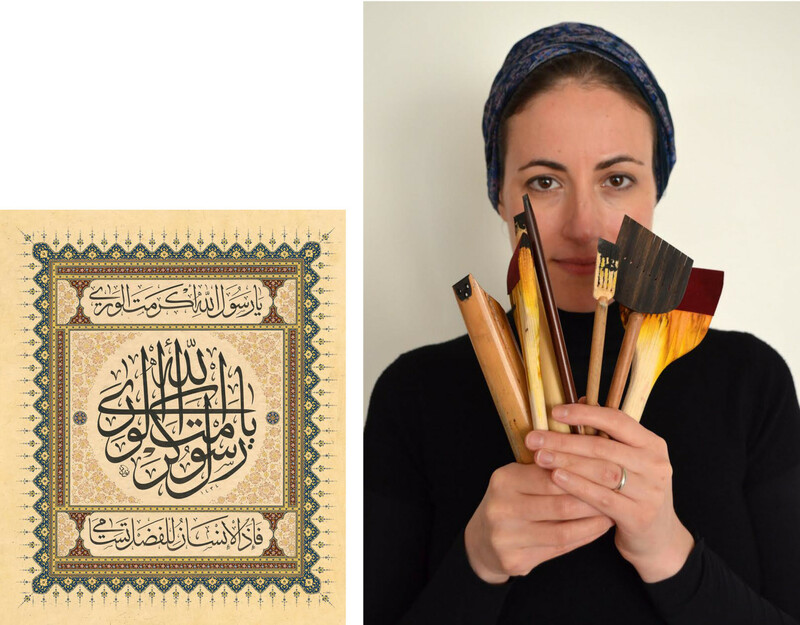 In 2001, when I started looking for a master, I heard about Mohamed Zakariya, a master calligrapher based in Washington DC, who had his ijaza from the great Turkish masters. I studied with him during two intense years following the traditional ottoman method based in the master-student relationship. I then moved to Istanbul where I continued my studies with his master, Hasan Çelebi, and with master Davut Bektaş. I received my ijaza (the calligraphic diploma) in 2007. Of course, I continue to visit my teachers regularly since the process of learning continues throughout our life. How did this prepare you for projects after you finished studying? I often tell my students the ijaza is only the beginning of our practice. It is what gives us permission, as calligraphers, to produce our own work and to teach and transmit what we have learned. However we are by no means ready to produce all types or formats of calligraphic works, we need to continue learning, progressing, attempting gradually larger and larger pieces and greater challenges. We are not alone, we maintain contact with our teachers and it is in this way that we are able to continue progressing. I think every piece encapsulates a particular challenge, I don’t think I can pick one out. Certain pieces which are, in appearance, deceptively simple take a lot of planning, sketching, and forethought. Others which may seem longer and more complex are sometimes easier. I always say every piece has certain kismet (destiny), some are inspired, others come through a lot of hard work. However, perhaps the most challenging, in terms of constancy, was two years ago. I had to write an entire juz of the Quran, recto verso, alternating two different sizes of thuluth script in under two months. 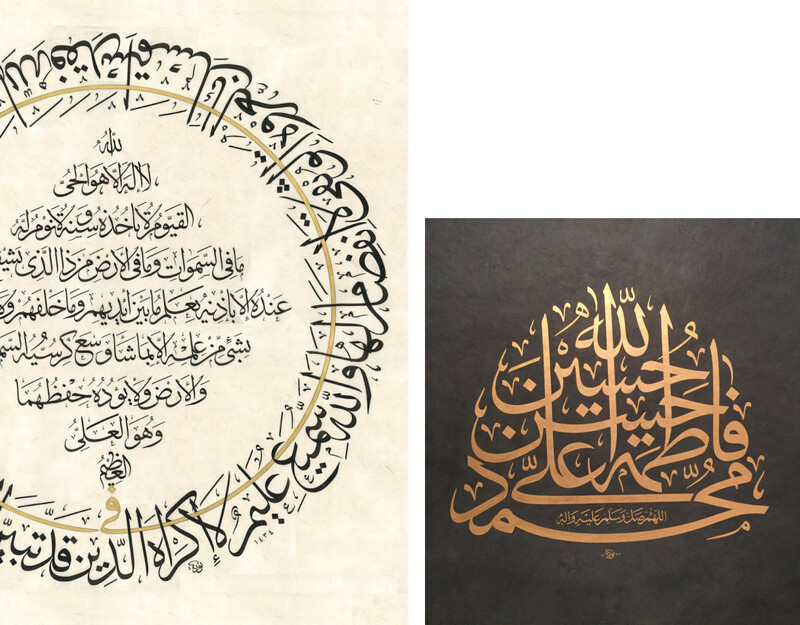 It was part of an initiative by the Dubai Ministry of Culture where each calligrapher wrote one juz (of course following the same layout, size, and paper) in order to complete the Quran in its entirety by the last week of Ramadan. I remember it was very challenging to keep up the same level of quality through the 27 pages in that limited amount of time. However, it was a very meaningful experience, especially coming together at the end with the rest of the calligraphers and finishing the last pages on Laylat al-Qadr (the Night of Power). What could be more meaningful for a calligrapher? What is particularly exciting about teaching at The Prince's Foundation School of Traditional Arts? It is now my fourth year teaching at the Prince’s school and I always enjoy the mixed group of students and the very welcoming atmosphere. It is always challenging to create a one-week intensive course in an art form which, in reality, needs years and years of practice in order to get any results. However, I think that through their enthusiasm and their affinity with the principles that are present in any sacred art, they are able to accept the challenge. My goal is always to make them taste a little bit of the love and patience that is such an important part of this art form.